Love there sheet sets and duvets. I’m very discerning when it comes to these. Never disappointed with the richness and sheen of the color. Soft and substantial. Add a little color to your bedroom with the Superior 400 Thread Count Cotton Sateen Duvet Cover Set. 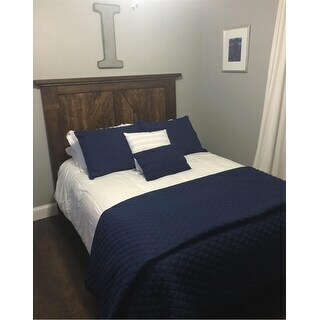 This set features a 400 thread count cotton construction that is available in a variety of stylish colors to complement your decor. Dimensions 11 in. x 14 in. x 4 in. 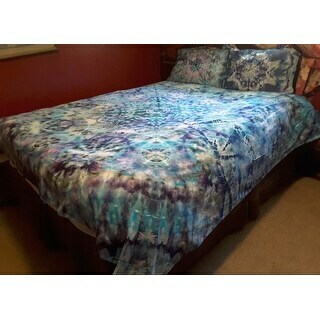 I buy these duvet covers in white for tie dyeing. The Egyptian Cotton and 400TC take the dye beautifully. They remain soft and smooth after multiple washings. Beautiful deep color (burgundy), gorgeous sheen, very soft fabric, true to color. I love this duvet and shams. It is well made. We received it when expected. The only thing I didn't like is I ordered a king to cover a king down comforter and the duvet is quite a bit bigger than the standard size king comforter. It is a beautiful addition to our bedroom. I love my duvet cover and two matching pillow cases too! I have been looking for a cover that pet hair and dust balls and what have you did not stick to. It has a soft feel and is a full feeling of very comfy cotton and washes well in my washer. I totally recommend this set ! It is so expensive looking I couldn't believe the quality. Money well spent! 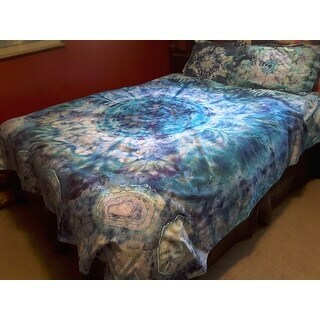 I purchased this Duvet cover for the 5" feather bed topper I bought from Overstock. 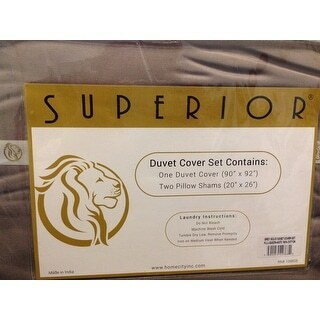 It is an oversized twin duvet and it fit the feather bed perfectly although the topper is for a full/ queen bed. I wanted extra protection for the topper even though it came with a very nice cover. I'm using both and its just what I wanted. Don't bother with this. I wanted to like it, the colors are great. I bought a King Teal for me and a Queen Grey for my BF. I returned his immediately because he thought it was scratchy, but decided to give the King a try. I think it's soft enough and it washed ok but after about 2 weeks of being on the bed it started pilling badly. We don't use a top sheet so this made it uncomfortable. Will be returning the king as well. It just seems cheap. If it's for a guest bed it would probably be fine and as I said the colors are really pretty and true to what they look like online. Arrived quickly. The color is lovely.Our bedroom is decorated in an old world european. Reds,golds,shades of white. I wanted to add something different. I nailed it! The Duvet Set is lovely. I have a beautiful flower arrangement,I went out and bought a few colors to match the duvet,plus a 4 by 6 picture with the same color. I couldn't be happier. These duvet sets are amazing quality for the price. I bought one each for each of my sons and a backup set! 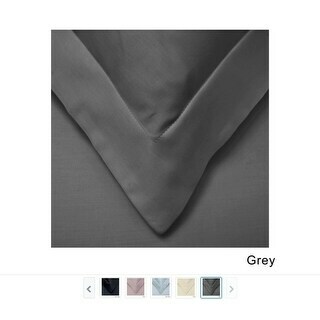 I ordered this duvet cover set (although didn't want the sham covers) based on the color shown here. When it arrived it was not the blue green shown here, but a pea green. I sent it right back and found another cover without shams elsewhere. I purchased this to match my other grey shades which are on the cool side - this is very warm and looks like taupe. The picture is very misleading. I have attached the pic from the site and my own pics of the actual color. Very dissatisfied that to return I have to pay the *** for the pre-paid label! We washed it once when it arrived and it's immediately soft. That's all I ever wanted. There were some mixed reviews on this duvet. I have to say I'm very please. 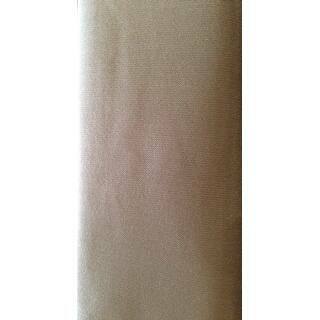 The quality of the fabric is very nice, especially for the price. It's soft and washed well. The color was exactly what I was expecting. I purchased the grey. Perfect color to match what I already had. Great quality with the 400 tc. I've purchased 2 thus far love it! The duvet is okay but not great. 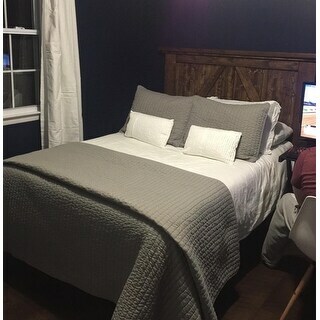 Looks like a sheet over the comforter and is always wrinkled. The duvet didn't even last three months before a hole appeared. There are no corner ties, and some of its burgundy dye managed to stain the comforter despite washing it beforehand. Unacceptable quality. I’ve had this cover for years in cream color. Super quality and does what it’s supposed to do, keep my down quilt clean! Goes with any change in decor too, great buy for the price! Nice at first, but got a little pilly over time. I have been using this set in the light pink for the last 6 months, and it still looks and feels so good! So much higher quality than I expected based on the price. They wash well and the color has stayed exactly like it was when I got it. I highly recommend!! High quality, thick material means I rarely get poked by threads. Didn't have ties on the inside corners, however, so I had to sew my own in. Now it's a dream. Would definitely buy again, but next time I'd use a sewing machine instead of hand-sew. "Are there ties to hold the comforter in place insite the duvet cover?" No, there are no ties. "Is this duvet thick enough that it would hide a print on a comforter?" I got the burgundy color and that definitely would be, I'm not sure about the lighter colors but I was a little disappointed with it. Within 1 wash the sateen finish was gone, it ended up pilling and becoming scratchy shortly thereafter. I bucked up and got the Ralph Lauren Sateen set and it was a total difference. With this set you get what you pay for. "I am looking for a tan duvet that is truly a warm tan and not a taupe. Can anyone weigh in on this color? Thanks!" I purchased this set about two months ago in the tan. It definitely is a true tan! I would honestly say though that is a shade lighter than what they show in the picture here. But definitely a tan. It is not a taupe color. "I am interested in purchasing this duvet set in lilac. I am wondering if the color is true to the picture, a grey-mauve, or, if it is more of a true purple/lilac. Thanks in advance!" we bought in white and we love it..no experience with colors. Nice fabric feel. We do not iron much of anything in our home. It's more of a cool toned lilac than the gray-mauve it looks in the picture. Also a bit more pale. "Does this item require ironing"
It is not wrinkle-free. I don't iron mine and think it is fine fresh from the dryer. I have a duvet cover. It was a bit wrinkled coming out of the dryer, but it's being used underneath a bedspread, so it didn't matter to me. Also, it gets rumpled every night. With that said, it's still not excessively wrinkled. Lots of small wrinkles, no big hard ones. "What is the teal colour considered on the featured (first) picture?" The main image for the Superior 400 Thread Count Cotton 3-piece Solid Duvet Cover Set displays our Teal color choice. Dear overstockcustomercare1, there is no option for "teal" in the product colour option?